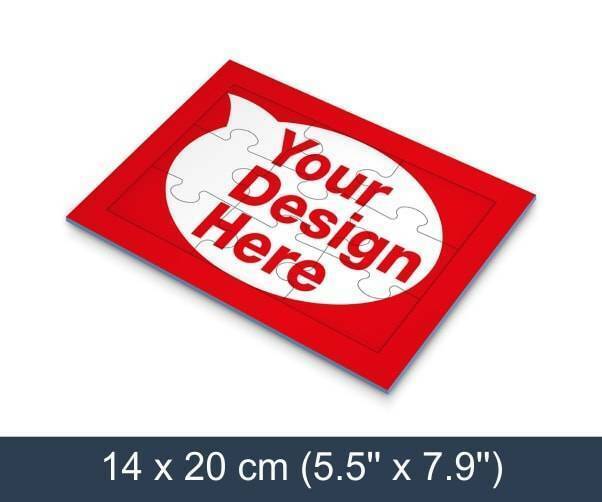 Click “create your jigsaw puzzle” to start personalizing this product, you will be able to select single or double side printing, upload your photo, add text, choose quantity and add it to your shopping cart. Minimum quantity for "9 piece tray jigsaw puzzle" is 100. 9 piece tray jigsaw puzzle is approx. in A5 size. 9 piece tray jigsaw can be customised from both sides, which means you can upload two separate designs. Cardboard frame and backing ensures that pieces are holding together and that there is no need for a presentation box. Tray jigsaw puzzles are used as giveaway material, promotional material and marketing material. Each 9 piece tray jigsaw puzzle is individually shrink wrapped in pvc foil!